We report plasmonic waveguide side-coupled with sectorial-ring cavity resonator which is called as side-coupled sectorial-ring cavity waveguide, and study the transmission performance of the novel system with oversize central angle, alterable symmetry plane angle, and fixed radius and gap. It is found from the two-dimensional simulation that the novel system excites the extra noninteger resonance modes, in contrast to the circular-ring cavity resonator system which can support only the classical integer resonance modes. The results show that the multiple resonance modes of the novel system can be highly tuned and modified by manipulating the size of central angle or the position of symmetry plane angle; the central angle has similar and different influences on resonance wavelengths and minimum transmittances, and the symmetry plane angle is almost unchanged on resonance wavelengths but has different changes on minimum transmittances. Interestingly, these resonance modes are extremely sensitive to the symmetry plane angle, the associated modes can be efficiently selected and improved by enhancing, weakening, exciting, or disappearing, and the maximum intensities occur at TM0.5(ϕ = 135o), TM1(ϕ = 0o), TM1.5(ϕ = 45o), TM2(ϕ = 0o or 90o), and TM2.5(ϕ = 45o), respectively. The proposed structure not only forms split-ring-like and realizes asymmetrical cavity, but also achieves tunable and selective transmission. 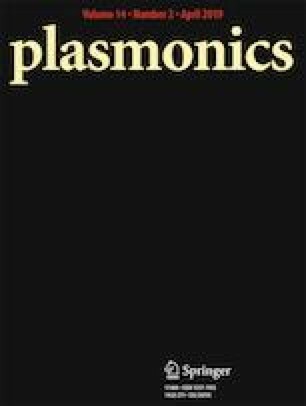 Our results indicate that the plasmonic nanodevice is a promising candidate as a tunable and selective multichannel nanofilter or nanosensor in nanophotonics applications, and the optical technique provides a good flexibility to accurately design the transmission spectrum with prospective modes in integrated nano-optics devices. This work was supported by the National Natural Science Foundation of China under Grant No. 61275174 and the Postgraduate Technology Innovation Project of Central South University under Grant No. 2017zzts062.